A brace of Black Shucks! Showdown at Grey Wayfarer's Inn! More fiction set within the Gaea Parallaxis world. The Common Standard for measuring and keeping time in the Gaea Parallaxis anti-verse is (like in our universe) the twenty-four hour clock in which there are twenty-four hours to each day. Presently these hours are numbered from 00 to 23, but throughout the past they were split into twelve Low and twelve High hours. Each hour has sixty minutes, numbered from 00 to 59, and each minute has sixty seconds, numbered from 00 to 59. For most everyday use hours and minutes are all that is needed, for example – 13:49 (previously known as 49 minutes past High-One, or 11 minutes to High-Two); but for more precise time keeping seconds can be used as needed, for example – 13:49:30. The day, as part of the solar cycle, is very much a reflection of the solar year. Like the year, a day is also divided into quarters; these are morning (spring), day (summer), evening (autumn) and night (winter). Also, as the solar festivals mark key times of the year, the tolls of the Watch mark key times of the day, often marked by tolls or chimes of a bell or clock. 03:00 = 3 tolls = Morntide [Morntaiyd], the beginning of the morning quarter - previously known as the hour of Low-Three. 06:00 = 6 tolls = Midmorning [Midmorning], the mid point of the morning quarter - previously known as the hour of Low-Six. 09:00 = 9 tolls = Daytide [Diataiyd], sometimes called Noontide [Nuuwntaiyd or Nüwntaiyd], the beginning of the day quarter - previously known as the hour of Low-Nine. 12:00 = 12 tolls = Midday [Middia], sometimes called Noon [Nuuwn or Nüwn], the midpoint of the day quarter - previously known as the hour of High-Twelve or High-Noon. 15:00 = 3 or sometimes 15 tolls = Eventide [Iyventaiyd], the beginning of the evening quarter - previously known as the hour of High-Three. 18:00 = 6 or sometimes 18 tolls = Midevening [Midiyvening], the mid point of the evening quarter - previously known as the hour of High-Six. 21:00 = 9 or sometimes 21 tolls = Nighttide [Niyttaiyd], the beginning of the night quarter - previously known as the hour of High-Nine. 00:00 = 12 or sometimes 24 tolls = Midnight [Midniyt], the mid point of the night quarter - previously known as the hour of Low-Twelve or Low-Noon. 1. The first morning Watch runs from 03:00 till 09:00. 2. The second morning Watch runs from 06:00 till 12:00. 3. The first day Watch runs from 09:00 till 15:00. 4. The second day Watch runs from 12:00 till 18:00. 5. The first evening Watch runs from 15:00 till 21:00. 6. The second evening Watch runs from 18:00 till 00:00. 7. The first night Watch runs from 21:00 till 03:00. 8. The second night Watch runs from 00:00 till 06:00. 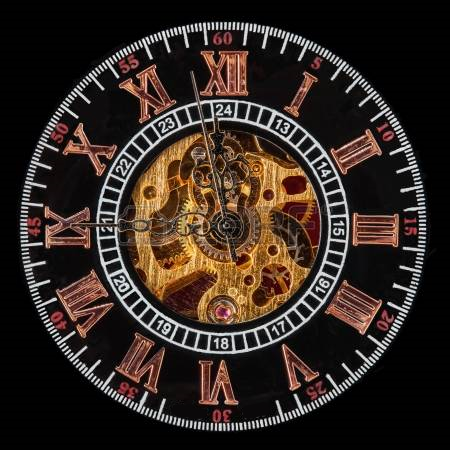 An individual would normally be expected to work at least seven, ideally non-consecutive, Watches (a total of 42 hours) in any eight day period (solar festivals not included for all bar the most essential professions). Comment on, discuss and debate the Time of the Day & the Tolls of the Watch by replying to the Blog Post HERE! Gaea Parallaxis will sometimes contain subjects and themes of a frank, profane, violent, horrific or sexual nature. If you are likely to be offended by such material, or by the use of adult language and expression, please do not continue reading the content of this web-site! This Site is probably not suitable for those under the mental and/or actual age of 15! Gaea Parallaxis is published free online by the 451 ePublishing Haus. What & where IS the Anti-Verse? Economy of the Sovereign Coin. The Hominid and other Races. Role-playing set within the Gaea Parallaxis world. Universal role playing game rules.